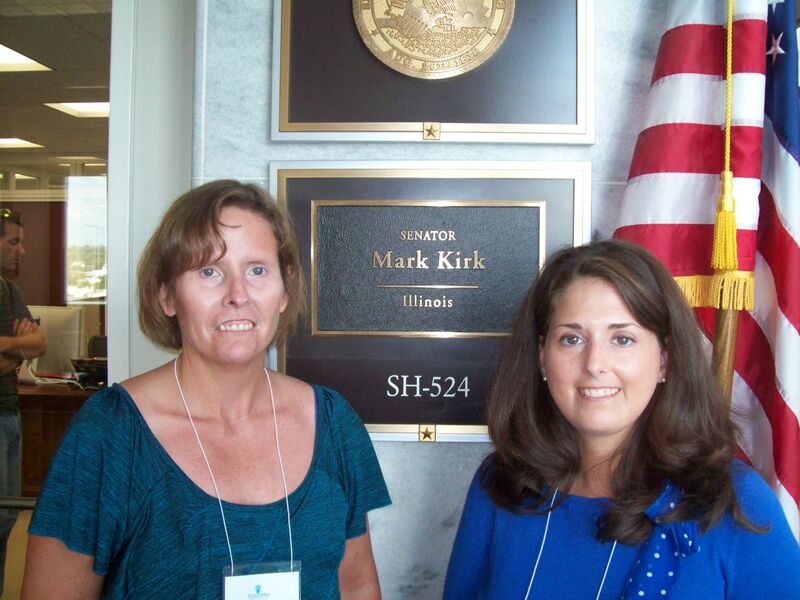 Cathy Crego, left, on an advocacy trip to Washington D.C. In this post, we highlight Cathy Crego as one of our amazing support group leaders! Read on and learn more about her and her support group. If you aren’t yet a part of a support group, consider joining one in your area! How long have you been running this group? I filled in as a leader for about 6 months, but have officially been the leader of this Kankakee group for one year. Number of people in your area that participate in your group? Currently, we have 14 members. Always open to more! When and where does your group meet? We meet from 10am-Noon on the last Saturday of each month at Riverside Medical Center, Conference Room A, in Kankakee, Illinois. What do you love about your group? I don’t know what is NOT to love about this group! They are very supportive of each other and very welcoming to new members. They truly care about the members of the group- when one person is having a rough time, they are there to pick them up. We have those members that are full of knowledge and always willing to let you know what is going on. I only wish we met more often! How does your group help and inspire each other? Over the past 18 months, our group members have been through a lot. The biggest thing is that we are compassionate and we listen to each other. No one tries to take over. When someone is struggling, whether with this awful disease or with something else in their life, we listen to them. We may not have the answers to solve their problems but each of them knows they can count on one another in times of need. Those that have had the disease longer than others and are more knowledgeable of the disease are willing to share their experience, but are careful not to push and say “this is what you need to do to solve your issues.” This support isn’t necessarily confined to just meetings either- I know some members will call or email to check on each other and/or will contact me to see if I have heard from them. Tell us an interesting fact(s) about yourself. Surprisingly, you wouldn’t know it, but I am actually relatively shy. I attended my first meeting by myself and was scared and didn’t know what to expect. But, here I am- 4 years later and leading the group! I was able to attend Advocacy Day on Capitol Hill when the government shutdown on October 1, 2013. Even though I am scared to fly, I traveled alone on that trip because the cause was well worth it. Any words of advice for patients and caregivers? Patients- don’t be afraid to ask for help! Don’t over do it- there is a tomorrow, but do live for today. Ask questions of your doctors if you don’t understand or agree. Don’t be afraid to switch doctors if you aren’t comfortable with your doctor. Spread the word about this disease so people can become more educated. Join a support group because they are wonderful. Caregivers- THANK YOU!! You are greatly appreciated! You are the rock that patients depend on. Know that sometimes we do not tell you everything and it’s not because we don’t want to share with you, but because it’s sometimes hard to not feel like we are being nagging to you. Also- it’s ok not to have answers, but just be an open ear to listen to us.